Japanese Government Defends Dolphin Hunt As Killing Goes On : The Two-Way The "drive hunt" by fishermen in one village is "a form of traditional fishing," a government spokesman says. Dolphins are trapped. Some are selected for sale to marine parks. Others are killed for meat. Thirty died Tuesday. Caroline Kennedy, the new U.S. ambassador, called the practice inhumane. Fishermen in wetsuits trap dolphins in a cove off Taiji, western Japan, on Monday. His nation's annual dolphin hunt "is a form of traditional fishing in our country," Japanese government spokesman Yoshihide Suga says in response to criticism of the practice from Caroline Kennedy, the new U.S. ambassador in Tokyo. "We will explain Japan's position to the American side," the chief Cabinet secretary adds, according to The Associated Press. "Deeply concerned by inhumaneness of drive hunt dolphin killing. USG opposes drive hunt fisheries." "USG" refers to the U.S. government. A "drive hunt," the AP notes, is "the practice of herding the dolphins into a cove, where they are trapped and [many are] later killed. The hunt in the fishing village of Taiji in western Japan has come under international criticism and was the subject of the Academy Award-winning 2009 film The Cove." 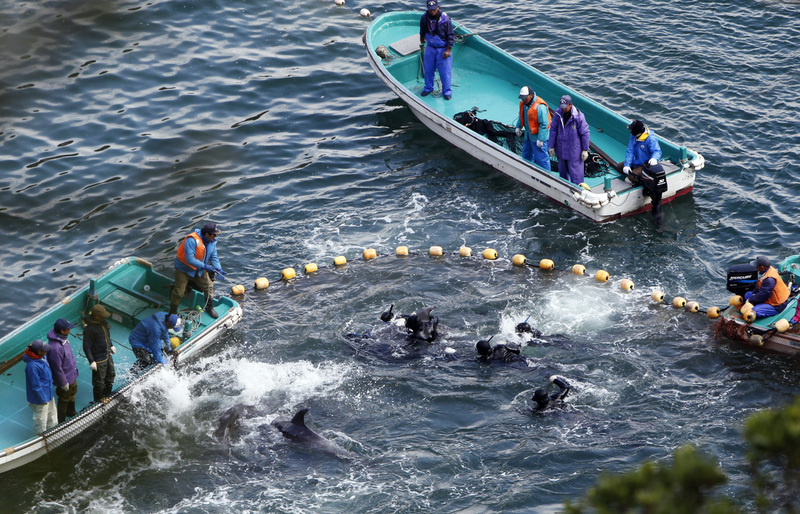 Taiji is the only place in Japan where this traditionally is done, as NBC News writes. The network adds that during the hunt, "fisherman from Taiji drive hundreds of dolphins into a secluded bay where they select some for sale to marine parks, release some back into the sea and kill the rest for meat." "Before the killing began, fishermen pulled a tarpaulin in front of the cove to prevent activists and reporters from seeing the killing. A large pool of blood seeped under the tarpaulin and spread across the cove." "You measure an activist documentary in two ways: first, whether it evokes a world, whether it brings the issues to burning life instead of giving you just talking heads. Second is whether it whips you up to join the fight — or at least send a righteous email. Director Louie Psihoyos' The Cove is gangbusters propaganda on both counts."